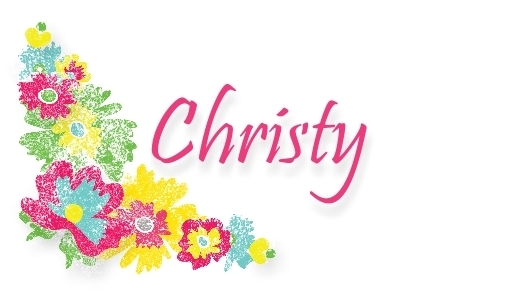 Create With Christy: Online Mystery Hostess Workshop! Hello, everyone! I've been wanting to do this for a long time! I'm having an Online Mystery Hostess Workshop, and it starts today! Place your order at my ONLINE STORE by Sunday, September 29, 2013 @ 8 p.m. (EST) to participate. All orders must use the hostess code, CUZYVYCY to participate. When placing your order, make sure you see my name, Christy Fulk, as the demonstrator. Your order must be placed with me in order to qualify. 1. EVERYONE who places an order will receive one of the cards pictured above (and below) in the mail. 2. Orders of $25 or more (before shipping & tax) will receive the card AND illustrated, step-by-step instructions on how to make the Envelope Punch Board Box and Card Set pictured on the right. The box can hold 4-6 cards with envelopes (depending on embellishments). 3. Orders of $40 to $149.99 (before shipping & tax) will receive everything above, AND get their name put into a drawing for the hostess benefits* I'll draw the winner** of the hostess benefits on Monday, September 30. I'll email the winner, and announce the winner on my blog as well. 4. Orders of $150 or more (before shipping & tax) - DO NOT ENTER THE HOSTESS CODE! 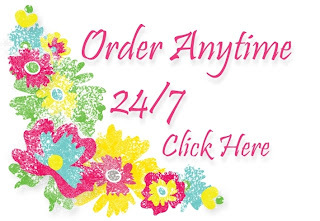 With orders this high, you'll qualify for your own hostess benefits of $25 or more from Stampin' Up!. Just make sure you redeem your hostess benefits before you checkout. You will still receive the card and the illustrated, step-by-step project instructions, too! *the grand total of all of the Mystery Hostess orders put together must come to at least $150 (before shipping & tax) in order to qualify for a workshop. **Mystery Hostess winners are responsible for paying for any half-priced items earned, shipping, and sales tax like regular workshop hostesses. These will be paid with either a credit card or Paypal. How do I enter the hostess code? 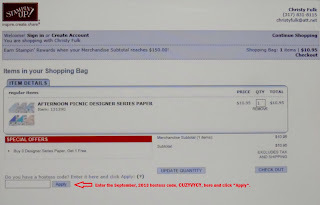 Once you place your first item into your shopping bag, enter the hostess code into the hostess code field on the lower left of your shopping bag, and click "Apply". Click on the picture above, right, to see what it looks like. What if I forget to enter the hostess code? Send me an email at christyfulk@att.net as soon as you place your order. I can add the hostess code for you, as long as it hasn't shipped yet. I'll check on orders every few hours to make sure the hostess code has been added to them all. If an order has already been shipped, it's too late for me to add the hostess code. How will I know you've received my order and I've been included in the Mystery Hostess Workshop? I'll send a thank you email to you once I get notification of your order, and let you know. I'll mail the cards out the first week of October...once all of the orders have been collected. When will I get my project instructions? 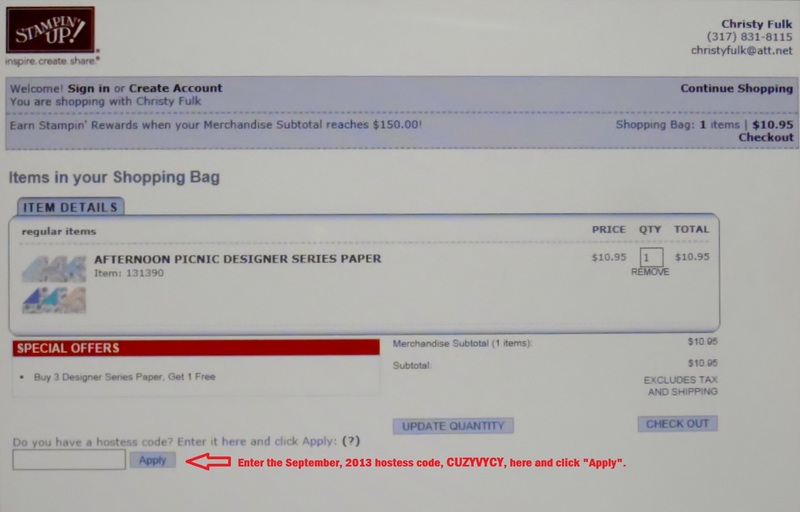 The instructions (in Adobe pdf form), will be emailed to you no later than the end of September. If you have any questions, please let me know. If this is a success, I'll start doing them every month.